Discussion in 'V7/V85/V9 Chat & Tech' started by GT-Rx®, Nov 7, 2017. Looks like the Carbon Shine might be one of them. I like! Much better than the Carbon imho. From the handbuilt show in Austin last week. Nice black leather seat! Very cool. Attackpug and Trout like this. My good friend Claudio (Longwalk.it - facebook.com/GiovenzanaClaudio) is in town from south south America, having left his bike in Patagonia for now as the weather has gotten too cold. He translated a printed article today on the V85 from Motociclismo. Big question that it answered (and I had guessed) was that they have basically lightened the reciprocating internals (rods & pistons) and went to larger titanium valves (2V per cylinder still), along with a new larger 52mm single throttle body (V7/V9 is 38mm) giving 78 HP @8400RPM and max torque (59 ft lbs) @3400 RPM (and holds steady they say.) The oiling circuit has been revised with a new twin rotor push/pull oil pump to help with scavenging from the crank. The motor will remain air-cooled through Euro-5. I look forward to adding one to the RideMalibu/RentAGuzzi fleet. Adam Davis, Conanidol, HarrierGod and 6 others like this. This would be a great results, since for now motorcycle should be "only" Euro 4 compliant. Euro 5 constrains are an headache for every engineer. BTW, an italian magazine has published some secret photos of the new engine. I will try to scan them and post here when I will have a copy of the magazine in my hands. GT-Rx® and Trout like this. This would be a great results, since for now motorcycle should be "only" Euro 4 compliant. Euro 5 constrains are an headache for every engineer. BTW, an italian magazine has published some secret photos of the new engine. I will try to scan them and post here when I will have a copy of the magazine in my hands. Yes, I have uploaded the article above. If your photos are different from above, I would love to see them. Last time I did see the photos. Yes, it that article. I still haven't read it, a huge thanks! First time I was a little bit confused, but now I have to admit that this "Legnano green" color it's quite nice. I have to declare here my appreciations for Guzzi: stop with colors for old men! This new ones are trendy and very original. No one other manufacturer would dare to propose that. New fresh air in the motorcycle world. Did you notice the radial brakes at the front (whereas the costly BMW F850GS mount traditional ones)? This bike is really going to stop in a matter of few meters! Conanidol, Poppe, Godfrey and 1 other person like this. Wow that color looks nice. This is going to be a hard one if they come out with some sweet colors. Love the idea of a "smaller" Stelvio and would certainly consider owning a V85. Only problem is that I prefer more subdued / traditional colors and at the risk of offending some, find the V85 color schemes a visual affront. 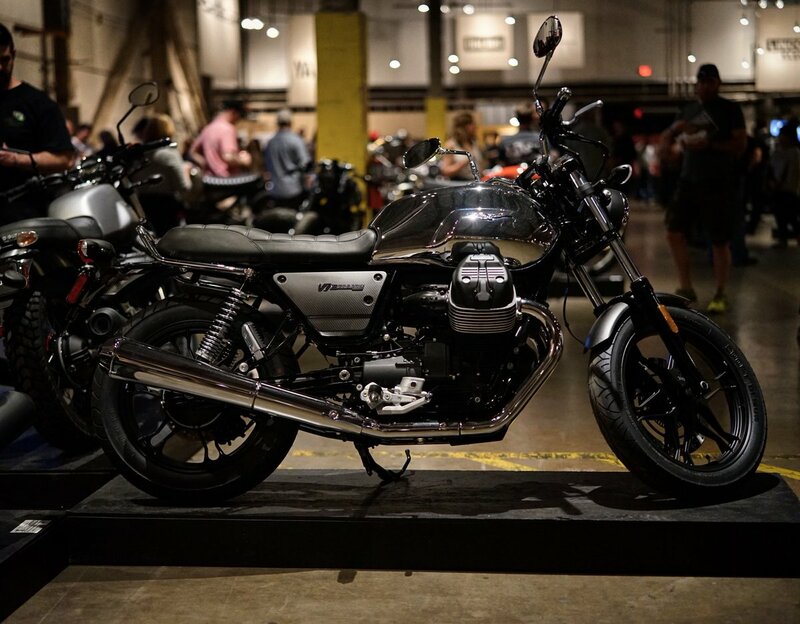 Hopefully a black or silver framed model with a more primary color(s) will be made available when Guzzi finally gets around to actually shipping these to the US. Also remember that Guzzi has always been a bit, um, optimistic when quoting HP numbers. I will be pleasantly surprised if this bike makes over 60 HP at the rear wheel as a stock V9 makes all of 50. It's not my kind of bike, but I'm delighted to hear of the engine development work. Sounds like solid, traditional performance development to me ... the kind of stuff that engine tuners have been developing on traditional two-valve engines for a century! It is certainly a joy to see the small-block Guzzi engines moving in this direction. The small-block history was all about minimizing cost to provide a low end machine, but the hemi heads on the V9/V7III and all the new bottom end work show that there's a good bit more future in this engine line. Put this engine into a more LeMans-ish road bike (like that illustration somewhere up thread) with these brakes and modern suspension, and Guzzi may well get another big lump of my money...! TimmyTheHog, Poppe, roadscum and 1 other person like this. I don't know about other Guzzis but my Stelvio has 105HP at the main shaft as declared and as tested from many Motorcycle magazines. For the power at the wheel (more easy to test at a common engine-bench) you have to calculate around 10% less for chain-driven final trasmission and around 12-14% less for cardan-trasmission. "Powering the bike is a new 850cc V-Twin engine that will be the base for future Moto Guzzi motorcycles. This engine produces 80bhp which is a considerable increase over the power output of V9 Bobber and V9 Roamer sold here. The V9’s 853cc V-twin engine produces only 55bhp. " Wow, is Guzzi actually listening? could you imagine 80 bhp V7? TimmyTheHog, Tequilasunriser and Poppe like this. If you’re one of those who liked the concept, you’ll be happy to learn that Piaggio has filed a design patent for what looks to be the final production model, and it does not stray too far from the original concept. Lodged May 1 in Australia, the design patent looks a lot like the concept but has some changes including a different exhaust and front brake master cylinder that look more realistic for a mass-produced vehicle. Here’s a look at the right side of the concept and the patent filing. While keeping the concept’s general aesthetic, there are some drastic changes. The fuel tank has a different shape and looks smaller than the one on the concept. The rear of the tank has a noticeably gentler slope up to the filler cap. The seat was changed accordingly to match the new slope angle, and looks quite a bit thinner than the saddle used on the concept. The side panel below the seat also has a different design, losing the concept’s slits for a more sculpted, geometric design. The rear shock remains offset to the right side, connecting the swingarm to the frame, but there is now a cover over top mounting point. The rear brake caliper was also repositioned, now located under the swingarm instead of above. The exhaust design looks more production ready, but still keeping the rising angle on the left side of the tail. The concept had a cylindrical see-through master cylinder while the patent illustrations shows a more typical black rectangular design. The blocky tires, bash plate, hand guards, front fender, tall windscreen and headlights all look similar to the concept. The design patent does add a center stand. Piaggio hasn’t filed any new trademarks that suggest a potential name for this new adventure-tourer, so it’s possible it will retain the Stelvio name and be called the Moto Guzzi V85 Stelvio. Expect to see the final production version at this fall’s big motorcycle shows, more likely at EICMA in November than the Intermot show in October. The latest information will be on Motorcycle.com as it becomes available. Thanks for the great write-up. Good catches on all of them. What is the benefit (or requirement?) of having a cover over the top mounting point of the rear shock? Also, maybe it was covered, but is this a completely new frame? Keeps goop off the shock I suppose. tobinh Tuned and Synch'ed GT Site Contributor! looks great. my name entry was 'scirocco', guess that's not going to make it. Thanks Todd for the write up +1! The front windshield looks taller to me and more upward compare to the concept...we will see how that affects the buffering. I'm hoping for a 200 mile plus fuel capacity. My entry was Stelvio.... Hmmm, now what?? Ya, I'm buying one the moment it arrives. Adam Davis, Poppe and Stevie like this.